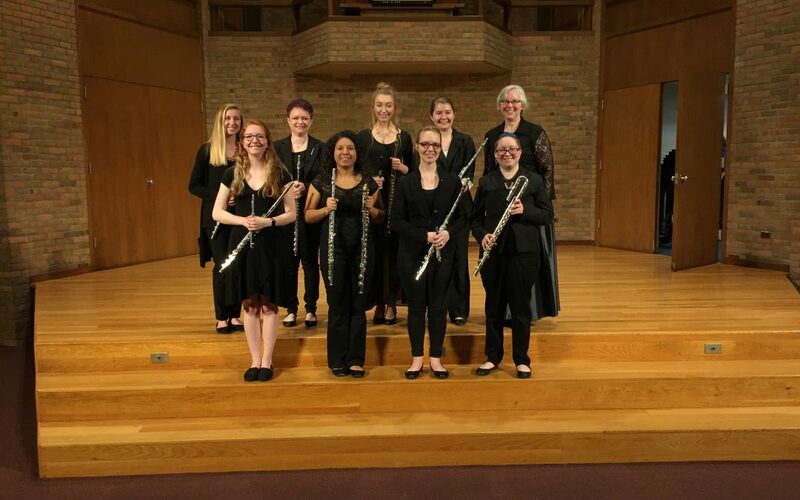 The Department of Music at the University of Mount Union will feature a performance by the flute choir and woodwind ensemble on Tuesday April 23 at 7:30 p.m. in Presser Recital Hall. Members of the flute choir, directed by Dr. Janet Becker, include early childhood education major Alicia O’Neill of Alliance, Ohio; community performer Brenna Price; community performer Lisa Price; human development and family science major Kari Gaebelein of Brunswick, Ohio; music education major Breanna Tompulis of Minerva, Ohio; music education major Natalie Kaufman of Conneaut, Ohio; music education major Brianna Potts of Orrville, Ohio and music education major Halle Robinson of Northfield, Ohio. The woodwind quintet, saxophone trio and clarinet trio will all be coached by Mrs. Betty Shultz. The woodwind quintet includes intervention specialist major Kassie Steed of Sebring, Ohio, flute; biology major Tia Swallow of Canton, Ohio, oboe; music major Joel Jennings of Alliance, Ohio, clarinet; music education major Abigail Adams of Port Washington, Ohio, horn and music education major Anna Brown of New Philadelphia, Ohio, bass clarinet. The Saxophone Trio includes environmental science major Hailey Fleming of Atwater, Ohio; music and intervention specialist major Brianna Potts of Orrville, Ohio and Japanese and music major Jordan Minns of Crestline, Ohio. Students performing in the clarinet trio include music major Alexandria Tilton of Canton, Ohio; political science major Olivia Ricciutti of Canfield, Ohio and human development and family science and art major Alysha Mitzel of Alliance, Ohio. The performance will feature pieces by Katherine Hoover, Paul Koepke, Charles Lefebvre, Jean Philippe Rameau, James Hook, Johann Friedrich Kranz and Wolfgang Mozart, among others. This concert is free and open to the public. For more information please contact the Office of Visual and Performing Arts at 330-821-2180.